Here at Mountain Crossings, we get a lot of questions about mail drops. For most folks, we are the first resupply point and for some we are the first place they send a box to. Here is a run down of mail drops from the minds of us at Mountain Crossings. Locations along the trail that accept mail drops end up getting a TON of boxes! Step one to insuring that your box will be there when you arrive is to properly address and label it. AWOL’s Guide is an excellent resource for finding the perfect mail drop spot in any town along the trail. 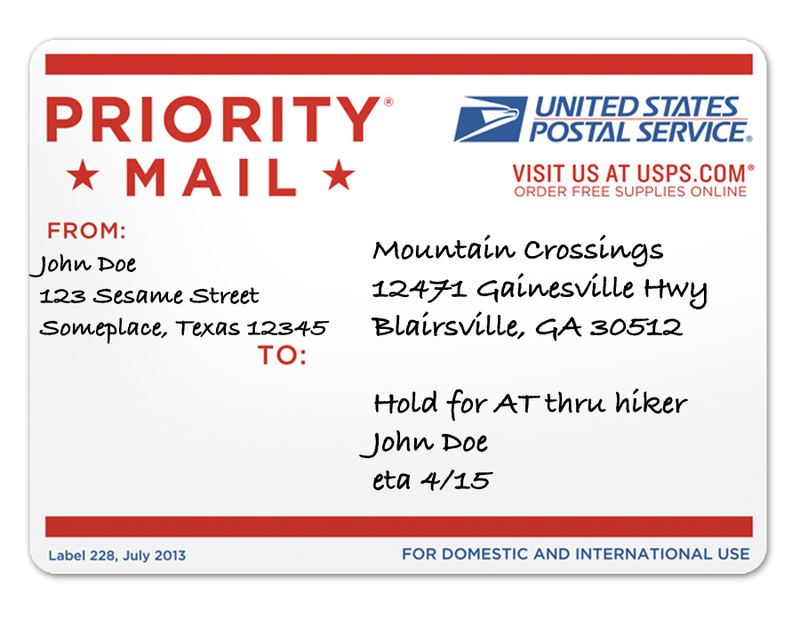 When writting the label, always include the line hold for AT thru hiker and be sure to use your real name when you send a mail drop to a location. Also include your estimated time of arrival (ETA). This way, those who are accepting the packages can file them by last name and ETA in order to keep tabs on each box. With the growing popularity of the Appalachian Trail, many locations along the trail have an excellent resupply option for thru hikers. After the price of buying the food at home, the cost of shipping a box can often times be more expensive than resupplying on trail. The argument for sending mail drop boxes is that there can be an up charge on food and other items at outfitters and hostels that offer resupply options. This surcharge is strictly to make having a resupply option available a worthwhile endeavor for the proprietors, thus saving hikers from an otherwise unnecessary hitch into town. 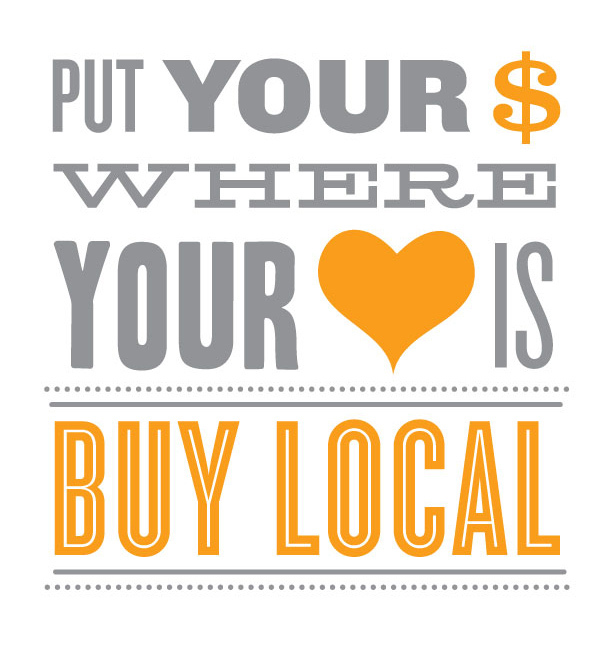 By purchasing your resupply in town or at outfitters and hostels along the trail, you are fuel the local economy and helping the build up communities along the trail. Some times a mail drop isn’t exactly what you need, but for some with specific dietary or medical needs, it can be crucial. In those cases, a bounce box can often be most useful. A bounce box is a box that you continually send up trail ahead of you. This allows a hiker to have a larger amount of an item at their reach without having to carry it all on their back. If a medicine or food is hard to find, a bounce box can be a great way to ensure you have it. If you get to town and find you do not need to open your bounce box, you can forward it up trail for free if you originally mailed it via the USPS Priority Mail. This can be done at any Post Office, but only at a Post Office. If the package is sent to a hostel or outfitter that is not in reach of a Post Office, forwarding can often times become difficult. Forwarding a bounce box or mail drop that has been sent via Priority Mail is a service of the Post Office only. Follow these guide lines and you will be well on your way to easy resupply boxes! 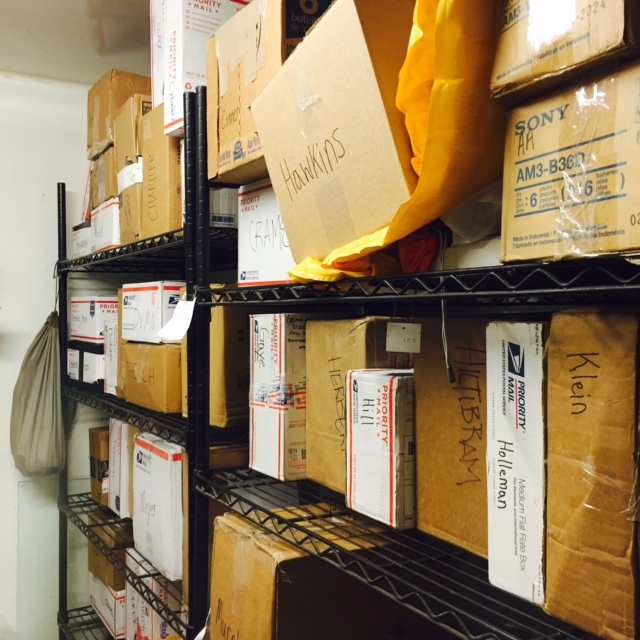 Our mail drops here at Mountain Crossings, alphabetized and stored by last name. Each day when boxes come in we stack them in their area and log each name and ETA in a book. That way we know approximately when each box should be picked up. This entry was tagged appalachian Trail, backpacking, Food, hiking, Mail Drop, mountain crossings, Neel Gap, Packages, thru hiking, Tips, Trail Food. Bookmark the permalink.